One of my favorite beaches in Wailea for a family photo session is Polo Beach, not only because of the spectacular views of Kaho’olawe, Molokini and West Maui, the lava rock and the light sand, but also because it is a quieter beach without the crowds that some of the other Maui beaches have. At this beach, you usually don’t have to worry about people in your backgrounds which any photographer will tell you, is a nice thing to not have to worry about! When Jessie and John Hinfey were contemplating a family photo session with me, I thought Polo Beach would be perfect. We had privacy and space to play (2 rambunctious 8 and 10-year-old boys!) so that the family could feel comfortable to be themselves and not be distracted by other beachgoers. The boys were able to be silly and just be boys while Mom and Dad enjoyed one another in the peaceful, calm setting that Polo Beach provides. The session went without a hitch and not only did we get a great sunset, but we had a great time on a beautiful summer night on Maui! What more can you ask for?! Thanks, Jessie, John, Jacob and Sean for asking me to capture your family photo session on Maui! 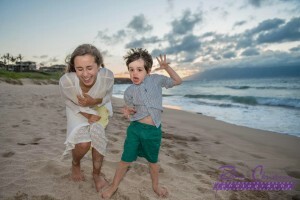 If you would like to schedule a session for your family while vacationing on Maui, just click here to contact me. And for some tips on preparing for a family photo session, you can read my blog post here. Thank you so much Robin! You did such a great job. We had so much fun doing the shoot with you. We will be in touch soon to do another shoot for our business. We wouldn’t call anyone else! Mahalo! Thanks Jessie! I’m so glad you guys are happy with the photos and had a good time. Your family is a lot of fun, and you guys made it easy for me to capture some beautiful moments with you all! Aloha Robin, I really want you to know how impressed I was with our photo shoot. Our boys can be a handful and you handled it like a pro. The pictures you took are fantastic! You are the best!! Thank you so much! Aww. Thanks, John! I was equally impressed with how well-behaved your boys are and what a tight, loving family you guys are. Thanks for allowing me to photograph your family. I look forward to many more sessions with you guys! We decided to do a photo session during our family vacation in Maui this past June. I can’t say enough about how wonderful this experience was…from making the arrangements to receiving the finished product. We are a family consisting of dad, mom, 3 adult daughters, a son-in-law, and a newborn. Robin was patient and understanding, particularly with the infant. She captured so many beautiful shots – both candid and posed. It was truly the most relaxed experience we’ve ever had taking family photos. Robin made the entire process effortless. She was available for questions leading up to the appointment and offered lots of expert suggestions. We filled out the questionnaire ahead of time so she already had an idea of personalities and the family dynamic. What I found amazing is that, based on the questionnaire answers (no physical descriptions), she greeted everyone by name. Robin is observant, professional, and laid back…all of these things created a relaxed atmosphere, which is evident in out photos. We had a blast doing this and we have our beautiful photos that capture this vacation. I highly recommend her for your photo session – you won’t regret it! Thank you, Kathy, for the awesome review! Your family was so fun and up for anything. Made for a really fun, successful shoot! Many alohas and mahalos to you!